Thursday, October 27, 2016 at 8:00 p.m.
James Currie, a prominent musicologist and University at Buffalo professor, will collaborate with Buffalo's dynamic and well-known new music ensemble, Wooden Cities, in a realization of his performance-art work, Examples of Excess. Both tragic and comic at the same time, Examples of Excess explores the excesses (emotional, political, and sexual) that haunt the fringes of our seemingly normal, day-to-day professional activities. Although the piece was not composed with any particular political agenda in mind, it is nevertheless pervaded by a sense of the extraordinary instability of the world we now inhabit and the resultant fragility of the professional roles to which we must therefore strive to conform. Its drama is a seemingly quite mundane affair in which, before an on-stage audience, an academic music historian is introduced, gives a lecture, and then answers some questions. But at every moment excessive emotions, ranging from fury and euphoria to profound despair, explode into its framework. The result is an accumulating sequence of disturbing and hilarious crises in which even the distinction between the lecturer and the music he is supposedly discussing starts to collapse. Like a kid in a candy store, the piece voraciously consumes all and any available performance gestures or clichè́s so that at its conclusion all that is left is the pleasures that have been gained from the excesses of the performance itself. And perhaps in the world we presently live in, that is the only conclusion to be drawn. James Currie is a writer and performer whose work has been concerned with articulating the points of interaction and dislocation between music, history, philosophy, and politics. His scholarly writings have appeared widely, and his book, Music and the Politics of Negation (Indiana University Press, 2012), is an extended political and philosophical critique of the contemporary academy and the ways in which it has betrayed the potential for human life embodied in musical art. 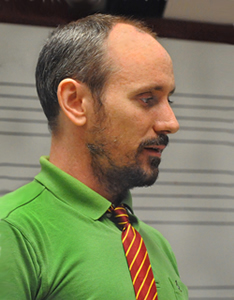 As a non academic writer, he has been active in the fields of poetry and performance art, and also worked in collaboration with a number of composers, such as Diana Soh, for whom he wrote the text for Arboretum, premiered at the Institut de Recherche et Coordination Acoustique/Musique in the Centre Pompidou in Paris, 2013. Educated at Cambridge University (UK) and at Columbia University in New York City, he has held a post-doctoral research position in the Society of Fellows in the Humanities at Columbia University, and taught in the College of Music at Loyola University in New Orleans and in the Department of Music at the University at Buffalo, where he is now an Associate Professor and on the faculty of the Center for the Study of Psychoanalysis and Culture. In the Spring of 2015 he was invited to be a full-time visiting professor in the Department of Music at New York University, and he is presently the holder of a fellowship from the Humanities Institute at the University at Buffalo. Wooden Cities seeks to increase the performance and awareness of contemporary classical music in Western New York through uniquely engaging presentations. 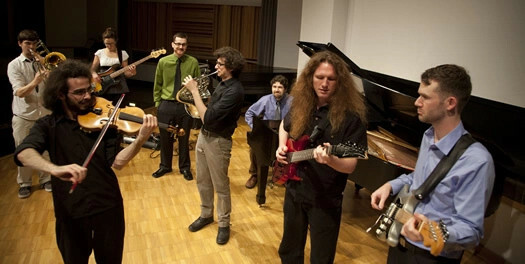 The group first formed in July of 2011 to present John Zorn's game piece Cobra. Since that time, the group has rapidly expanded its repertoire to include traditionally notated works, graphic scores, and improvisatory music. Wooden Cities remains committed to seeking new works by young composers while presenting essential, and in some cases underrepresented, composers of the 20th and 21st centuries. The ensemble has presented events at many of Western New York's most important arts venues, including the Albright Knox Art Gallery, the Burchfield Penney Art Center, Hallwalls Contemporary Arts Center, Kleinhans Music Hall, Lippes Concert Hall, Silo City, and St. Joseph's University Parish, while also presenting music by Buffalo composers in cities like Cleveland, Lafayette, Indianapolis, Louisville, and Toledo. The ensemble has premiered over twenty newly composed works, including several pieces commissioned specifically for the ensemble itself. With funding from the Muriel Wolf and Albert Steger Endowment, Wooden Cities has also reconstructed several works from Buffalo's rich history of contemporary music, presenting works—such as Lejaren Hiller's Avalanche (1968)—which had not seen a performance for many years. The ensemble's 2016-17 season will see concert residencies at Buffalo State and Houghton Colleges, and a teaching residency with the Youth Orchestra of Bucks County (Philadelphia).